This post was published in Pasquines on October 4, 2018. At the end of September, Newsweek’s Robert Valencia interviewed Puerto Rico’s pro-statehood governor, Ricardo Rosselló. They met a few days after President Donald Trump told Geraldo Rivera that he did not support Puerto Rico’s statehood aspirations. The president also blamed the island’s recovery on Carmen Yulin Cruz, the Mayor of San Juan, and other “incompetent” leaders. Rosselló used the interview to make a case for why Puerto Rico should be admitted as the nation’s 51st state. In making his case for statehood, Rosselló made two problematic statements that require further scrutiny. For example, he told Valencia that “Prior to the storm, only 20 percent of U.S. citizens in the mainland knew that we were citizens, and now, more than 90 percent do.” For the governor, this is Hurricane Maria’s silver lining. But, it is not clear how Rosselló reached this conclusion, as survey data discredits his view. 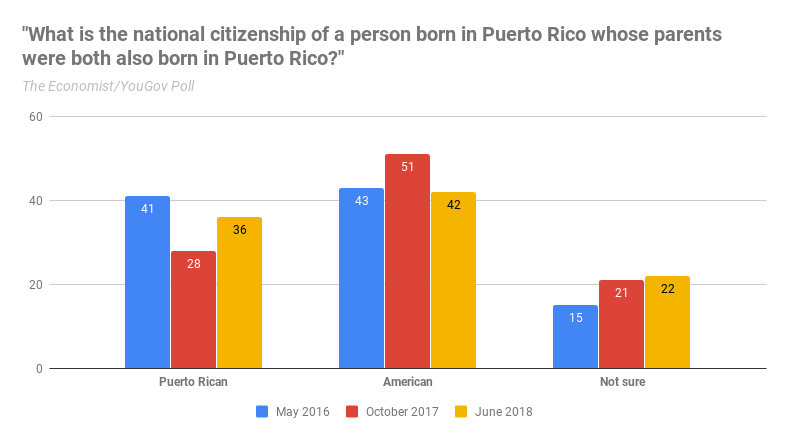 For the last two years, The Economist/YouGov poll has asked its respondents the following question: “What is the national citizenship of a person born in Puerto Rico whose parents were both also born in Puerto Rico?” Let us look at the responses collected on May 2016 – as Congress debated the PROMESA bill, October 2017 – following Hurricane Maria, and June 2018 – after the New England Journal of Medicine published a study argued that the storm claimed the lives of an estimated 4,465 individuals. The results of the most recent poll are not too encouraging. The number of people who were “not sure” about Puerto Ricans’ citizenship status has increased in the last two years. While the increased media coverage of Hurricane Maria helped many Americans realize that Puerto Ricans are U.S. citizens, the newest survey shows a substantial decrease in the number of Americans who understand this reality. Trying to gauge Puerto Ricans’ support for statehood, Valencia asked Rosselló whether the low participation rate in the June 2017 status plebiscite was an indication that Puerto Ricans “have lost interest in statehood.” He also asked the governor whether his constituents’ support for statehood has changed in the last year. Rosselló argued that “The only reason folks decided not to participate in the plebiscite last year was that they knew what the outcome was going to be: that people were going to support statehood.” He also stressed that the current “support for statehood is big.” Let us look at the first statement. It is difficult to explain why voters did not participate in the referendum. El Nuevo Dia conducted a poll two weeks before the vote that found that 52% of registered voters favored statehood, while 11% noted that they would not participate in the process. Another survey predicted the statehood option would win with 56% support and it found that only 15% would either support the opposition parties’ call for a boycott of the plebiscite or would not vote. Given that the average participation rate in past status plebiscites and referendums is 72%, why did so many registered voters abstain from the vote? After the plebiscite, Jose Alfonso, who conducted El Nuevo Dia’s poll, re-surveyed the respondents in the original study. Based on these conversations, he argues that only 7% did not vote to show solidarity with the boycott. Around half of the sample explained that did not vote because the results of the plebiscite were not binding. Another 24% of respondents explained that the process was not fair and that Rosselló’s New Progressive Party (NPP) had included status options that did not reflect voters’ preferences. It is not also clear whether Puerto Ricans’ support for statehood has increased or decreased after Hurricane Maria. However, a recent Washington Post/Kaiser Family Foundation survey, conducted in Puerto Rico this summer, concluded that 48% of Puerto Ricans support statehood and 26% the status quo. While 10% favor independence, 16% refused to answer the question or did know now which option to choose. These results clearly demonstrate that Rosselló has exaggerated Puerto Ricans’ support for statehood after Maria. Why are Rosselló’s statements problematic? For statehood to become a reality, Rossello and the NPP’s leadership need to get their facts straight. While media coverage of Puerto Rico has increased in the United States since Hurricane Maria devastated the island’s infrastructure, there is little evidence that U.S. citizens in the mainland know more about Puerto Ricans’ legal status or support the island’s incorporation as the 51st state. Just because 97% of those who participated in the 2017 status plebiscite voted in favor of statehood does not mean that most Puerto Ricans support statehood. If Rossello and the NPP leadership want Puerto Rico to become the next state of the union, they have to recognize that the statehood movement still faces lots of obstacles and that the NPP will need to spend more time and resources persuading Americans, both in the island and the in the mainland, about the benefits of statehood for Puerto Rico and the nation as a whole. About the author: Carlos L. Yordán is an associate professor of political science and international relations and the director of the Semester on the United Nations at Drew University in Madison, N.J. He is currently researching U.S.-Puerto Rico relations in the aftermath of Hurricane Maria.